In Toronto visiting for the weekend, a friend of mine mentioned this place to me as somewhere she had been eying for some time. Working across the street, it’s been constantly in her field of vision, so we went ahead and gave it a shot. Dropping around the noon hour for lunch, the inside of the place was virtually empty whereas the patio outside was dotted with people. The sun was shining and with the temperature being over 30 degrees outside, we opted for the comforts of air conditioning instead. 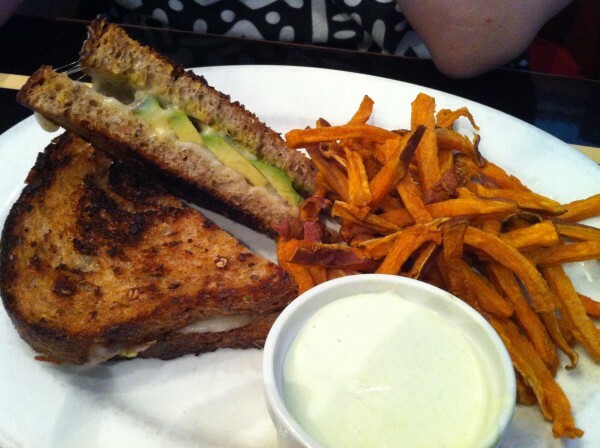 My friend had heard delicious things about the grilled cheese sandwiches – the jalapeno-avocado-havarti in particular, so she chose that one without hesitation. 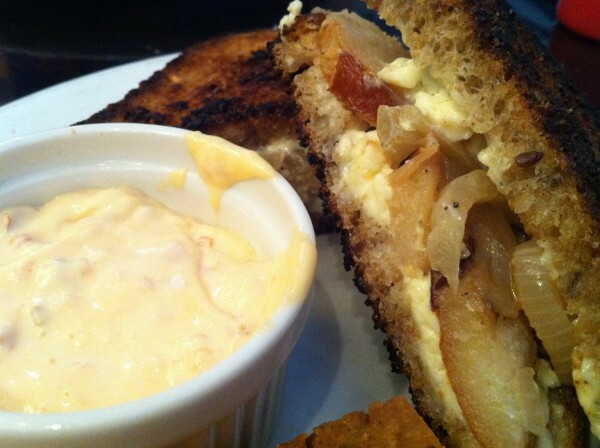 I felt like something relatively lighter so I had the roasted pear, caramelized onion and blue grilled cheese. Note the use of the word ‘relatively’ and ‘lighter’ with a grain of salt. 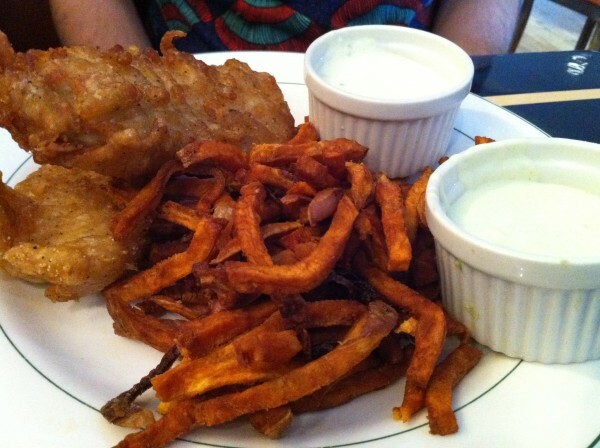 A fish and chips was also ordered. We each decided to ‘upgrade’ our sides of regular fries/salad to sweet potato fries and chickpea fries which came with wasabi and chipotle mayo respectively. The chickpea fries were pretty interesting because you could actually taste the blended chickpeas. There was a hint of sweetness from the coconut milk and a bit of spice thanks to the chipotle mayo it was pressed and fried with. The sandwiches were both good and were finished off with ease. Same can be said for the fish n chips. Everything was good, but not memorable. Check it out for some easy diner type food. Or not. Tags: avocado, Blue Cheese, Breakfast, Brunch, Caramelized Onion, Chickpea Fries, Fish and Chips, forkandtell, Grilled Cheese, Havarti, jalapeno, Lunch, Queen West, Roasted Pear, Sweet Potato Fries, Toronto.